In the Introduction, we broached the idea that the way other cultures parent might be more “right” than the way that the culture in North America parents, as discussed in the book Parenting Without Borders. In Part 1, we looked at some of the different cultural thoughts around sleep. There was also that stunning example of how it’s normal for babies in Scandinavia to be found taking a nap on the terrace in the dead of winter! In Part 2, we explored “stuff” and how having more of it might not be best for our children. In Part 3, we looked at how different cultures relate to food in the context of parenting. In Part 4, we looked at how saying “good job” to our little ones might not have the effect we think it does. In Part 5, we talked about the virtues of allowing our little ones the space to work through problems on their own. In Part 6, we examined the importance of unstructured “play.” In Part 7 and Part 8, we explored what education is like in East Asia and Finland. In Part 9, we’ll look at cultural notions about rearing our children to be kind. If you’ve been following this series, no doubt there may have been some things that have made the hairs on the back of your neck stand on end. And if that hasn’t been the case up to this point, it wouldn’t surprise me if this chapter is the one that finally does it. One of the first anecdotes, while it shouldn’t be, is still a bit shocking [Emphasis Added]: “In 1970, the primary goal stated by most college freshmen was to develop a meaningful life philosophy; in 2005, it was to become comfortably rich.” It’s no wonder that the way we treat each other in today’s society may seem a bit different than the way we treated each other 50 years ago (“-isms” like racism and sexism aside, of course). As a quick aside — how different would society look like today if the goal of 90% of university students was to develop a meaningful life philosophy, rather than to get rich? Near the beginning of this chapter, Gross-Loh recounts how some of the parents she knows are emphasizing (possibly unintentionally), individuality over community awareness. What does that mean? Well, for example, she retells the story of a mother of a three-year-old rushing to comfort her son after her son had thrown a wooden toy and hit Gross-Loh’s son in the head. The idea behind this is that the other parent was trying to get her son to understand the feelings he felt that precipitated the chucking of the wooden toy at the other kid. Allowing children to behave as they want to until they feel like acting differently actually makes our kids more miserable and less compassionate. Children who have too few boundaries often flail around for a solid surface to ground them. Believe it or not, research shows that children are born with a sense of kindness, but that’s not enough. If this sense of kindness isn’t fostered and reinforced by parents, it can be “overwritten.” Similarly, research has shown that kids are happier when they’re giving something to someone else than when they receive it. That shouldn’t be too surprising (spending your bonus on your coworker will make you happier than spending it on yourself!). An important aspect of this is incentives. If we reward kids for sharing through incentives, we may unintentionally dissuade them from developing a sense of internalizing the virtue of sharing (thereby dissociating sharing from its innate spontaneity and instead, teaching our children to expect an external reward whenever they share). Parents who teach their children to speak with authenticity and honesty but do not simultaneously teach them the art of being considerate send their children the message that it is always better to be honest to your true self even if it means hurting someone. While American mothers often orient their babies to things apart from themselves, such as objects, Japanese mothers more often orient their babies to themselves, encouraging a constant awareness of relationships and the impact of one’s actions on other people. In disagreements that warrant adult intervention, kids are asked what they think the other person felt that motivated him. Can you imagine how different American society would be, if every kid is taught the value and importance of considering the underlying motivations of the actions of their friends and other people? The term Data Science appeared in the computer science literature throughout the 1960s-1980s. It was not until the late 1990s, however, that the field as we describe it here, began to emerge from the statistics and data mining communities. Data Science was first introduced as an independent discipline in 2001. Since that time, there have been countless articles advancing the discipline, culminating with Data Scientist being declared the sexiest job of the 21st century. Unsurprisingly, there are countless graduate and undergraduate programs in data science (Harvard, Berkeley, Waterloo, etc. ), but what is data science, exactly? Pithiness aside, there does seem to be consensus around some of the pertinent themes contained within data science. For instance, a key component is usually “Big Data” (both unstructured and structured data). Dovetailing with Big Data, “statistics” is often cited as an important component. In particular, an understanding of the science of statistics (hypothesis-testing, etc. ), including the ability to manipulate data and almost always — the ability to turn that data into something that non-data scientists can understand (i.e. charts, graphs, etc.). The other big component is “programming.” Given the size of the datasets, Excel often isn’t the best option for interacting with the data. As a result, most data scientists need to have their programming skills up to snuff (often times in more than one language). Now that we know the three major components of data science are statistics, programming, and data visualization, do you think you could identify data scientists from statisticians, programmers, or data visualization experts? It’s a trick question — they’re all data scientists (broadly speaking). Why do people use the term “data scientist” to describe all of these professionals? We think that terms like “data scientist,” “analytics,” and “big data” are the result of what one might call a “buzzword meat grinder.” The people doing this work used to come from more traditional and established fields: statistics, machine learning, databases, operations research, business intelligence, social or physical sciences, and more. All of those professions have clear expectations about what a practitioner is able to do (and not do), substantial communities, and well-defined educational and career paths, including specializations based on the intersection of available skill sets and market needs. This is not yet true of the new buzzwords. Instead, ambiguity reigns, leading to impaired communication (Grice, 1975) and failures to efficiently match talent to projects. Within these clusters fits some of the components described earlier, including two additional components: math/operations research (including things like algorithms and simulations) and business (including things like product development, management, and budgeting). 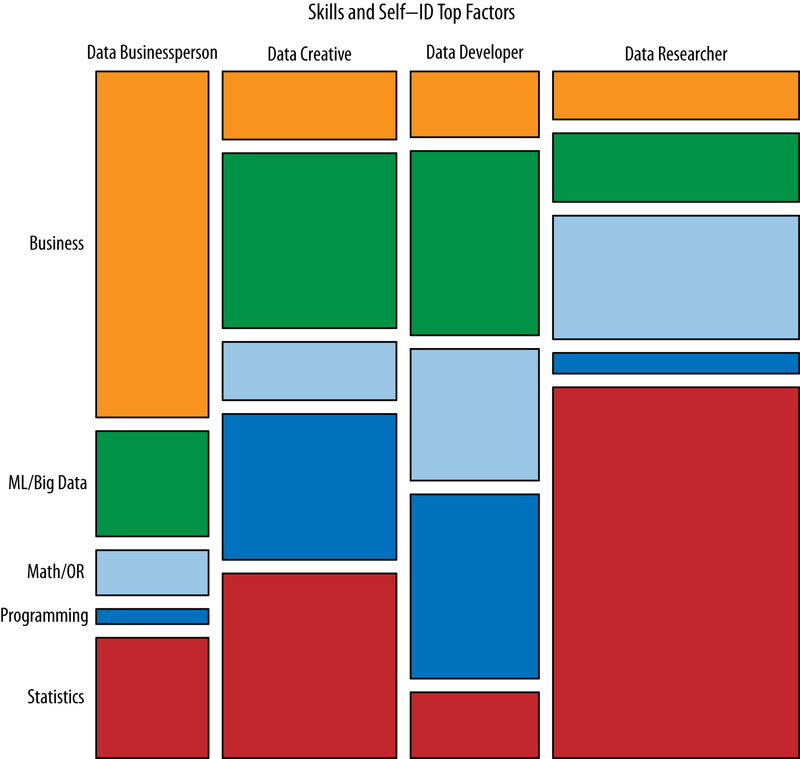 The graphic below demonstrates the t-shaped-nature of data scientists — they have depth of expertise in one area and knowledge of other closely related areas. NOTE: ML is an acronym for machine learning. NOTE: This post originally appeared on GCconnex. Women Read More Fiction: Is That Why They’re More Empathic? When I first saw that, I was a bit surprised. Statistics tells us that for every 100 females born, there are 105 males born. So, there should be more boys than girls and as a result, we might expect that more boys would be reading than girls. Of course, there are so many other factors involved, but from a volume standpoint, I’d think that more boys would read than girls. I thought I’d click-through and read the report, but it’s behind a wee bit of a paywall to the tune of $799. As a result, I won’t be able to (maybe you or someone you know can?) read over the statistics. Nonetheless, I had a different direction I’d like to take this post. Empathy. I’ve written before about how reading fiction can boost empathy. This very important human skill needs to be cultivated and one of the ways to do that is to read fiction. In addition, we all know the ‘stereotype’ that women are more empathetic than men. However, when there’s data to back it up, I suppose that it’s not so much a ‘stereotype’ as a likelihood. So, in putting these pieces together, my thought was that maybe this empathy gap has grown because women are more likely to read fiction than men. Sounds plausible, right? In doing research for this post, I came across something from the Greater Good Science Center at Berkeley. That post was talking about whether women’s empathy is the result of nature or nurture. It cited a few studies supporting both sides of the debate. I wonder if we could then add the data point of women reading more fiction to the nurture side… or the nature side? Nature side, you ask confused? Well, in saying that women read more fiction leading to greater empathy, we’d have to test whether women reading more fiction leads to a greater empathy or if women having greater empathy prefer to read. If you know anyone doing empathy research, this might be an interesting study.